Simply scroll through the page or click one of the links below to learn about this artwork. One of the central and most celebrated bodies of “Secret Art” created by Ted Geisel is a series now known as his “Big Cats.” Aficionados familiar with these works are well aware of the artistic significance and heightened demand for images such as Wisdom of the Orient Cat, Indistinct Cat with Cigar, Cat from the Wrong Side of the Tracks, Joseph Katz and his Coat of Many Colors, A Plethora of Cats, Alley Cat for a Very Long Alley, Green Cat with Lights, and the few others among this extraordinary league. Two years later, Orient Cat was featured as the cover image on The Cat Behind the Hat coffee table book. Once again interest surged, making it one of the most sought-after artworks from the entire collection. 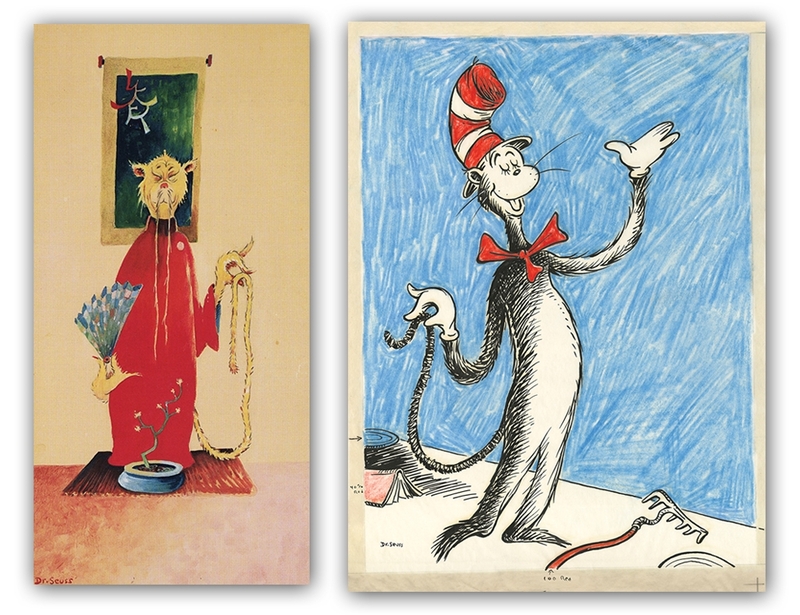 Ted’s famed “Cat in the Hat” burst on the scene over 50 years ago, in seemingly reckless abandon, turning a young brother and sister’s house upside down in Dr. Seuss’s first The Cat in the Hat book. Yet, in the end, the Cat’s quick wit and ingenuity saved the day, and he returned their home to normalcy just before their mother stepped through the door. When the long sold-out Wisdom of the Orient Cat was first published six years ago, it was made known in the release announcement, through the Art of Dr. Seuss website, and the Wisdom of the Orient Cat Certificate of Authenticity, that a deluxe edition was reserved for future publication. Now, after years of anticipation, the wait is over. Below are the details for this exceptional masterwork. Artwork shown to scale 62”x31". Print on paper, shown unframed. The Wisdom of the Orient Cat Deluxe Edition was created utilizing ancient methods of papermaking introduced to Japan in 610 by the Korean Buddhist priest Doncho. These papermaking skills have been passed down from generation to generation with the intent of producing paper that is not only functional, but also reflects the soul and spirit of the maker. As stewards of Ted’s important artistic legacy, it is with great pride that we bring such a vibrant artwork to the world, marrying traditional printmaking techniques with legendary, handmade Japanese paper production. This paper was handmade under the personal direction of Mrs. Masami Igarashi of the Igarashi Paper Mill, established by her husband’s family in 1919 in Fukui, Japan. It took several months for Igarashi’s skilled staff of 10 artisans to develop and produce the 250 sheets of Washi required for this special edition. The strong, yet flexible, Washi is firmly rooted in Japanese culture and is still used for special religious purposes, both Buddhist and Shinto, in the production of daily items such as fans and garments, and in its most universally recognized function—traditional architecture. The video below demonstrates the practice behind the handmade paper used for the Wisdom of the Orient Cat Deluxe Edition. Note: This was not filmed at the Igarashi Paper Mill where the paper for this edition was produced. Kozo is the primary material for Washi and grows 10 feet between its annual harvest. In winter, the Kozo shrubs are harvested by cutting the stalks t equal lengths and bundled. The bark is made up of three layers, the black outer layer (kurokawa), the middle green layer (nazekawa), and the whiter inner layer (shirokawa). There are some papers which use pieces of the outer black bark and middle green layers, however most do not. The Kozo bundles are placed in wooden barrels and steamed . After being steamed, water is then poured over the stalks enabling the bark to slip off easily, at which time the fragrance of Kozo is very rich. The next step is the removal of the black outer layer from the strips of bark. The softened bark is carefully stepped on in water and rubbed between the feet to remove the loosened black bark without damaging he fibers. Then the green layer is carefully scraped away with a knife. The natural whiteness of the paper is determined by how much of the green layer is removed. Any discoloration or branch scars are also removed. The strip of bark is kept in as long as a piece as possible. The now cleaned white bark (shirokawa) is dried in a cool, shaded area until ready for further processing. The light bark is then placed in the shallow waters of a clean running river to wash away all impurities, at the same time bleaching of the Kozo bark occurs in direct sunlight giving it a natural white color. Cooking is done in a large tub until the white bark is very soft. It is very important in this step to cook the bark evenly so that the fibers have a consistent makeup. The fibers are cooked for about two hours in an alkali solution. Traditionally the alkali used was extracted from wood ash (pot ash), but now slaked lime, soda ash, caustic soda, or lye are generally used instead. The alkali solution is heated until it boils and then is lowered to a simmer. As the fibers soften, the bulk of the fibers decrease. The quality and feel of the washi is determined by the amout of non-cellulose materials contained in the fibers. When a strong alkali is used, most of the non-cellulose materials are dissolved and this results in a soft paper, on the other hand, when a wek alkali is used moreof these materials remain resulting in paper which has more body. The type of alkali used can also affect the color and feel of the paper. The rinsing and cleansing process after the fibers are cooked is called "Chiritori>" A small amount of the cooked fiber is put into a bamboo basket floating in water and then any scar tissue, buds, unevenly cooked parts or siscolored areas are removed by hand. If white paper is to be made, the fibers are bleached before the chiritori process. Usually sodium hypochlorite is used but natural bleaching methods using water or snow are still sometimes used. The Kozo fibers are beaten on a stone using a wooden mallet. This is done many times to create a fibrillation. The sound of this process is loud and rhythmic, adding to the atmosphere of Japanese paper manufacturing. Two essential pieces of papermaking equipment are the vat (suki bune) and mould (suketa). The vat is usually made from pine or cedar but a stainless steel liner may be added for durability. The Japanese style papermaking mould consists of two parts. The specially made flexible removable screen (su) is made of fine bamboo strips held in place by silk threads. Kozo pulp and Neri are mixed in water very well. Then using a Su (bamboo screen) and Keta(wood frame) the mixture is moved aback and forth, and side across the mold to form the sheet. The fiber settles and the step is repeated again and again depending on the desired thickness is achieved. This method is very different from the Tamezuki or accumulation method of making paper. The Tamezuki method is the Japanese term for the western style papermaking. The first scoop is shallow dip that is quickly flowed across the surface of the screen to form the face or front of the sheet of paper. The excess pulp is allowed to flow over the far edge of the mould. The rapid movement prevents any hard particles from setting on the screen surface. The next step consists of a deeper scoop into the vat and the pulp flows over the screen several times before any excess is allowed to flow over the far edge. This step is repeated several times until the desired thickness is achieved. The movement of the pulp mixture on the screen surface varies according to the kind of paper being made. There is an overhead bamboo suspension system that helps to counterbalance the weight of the pulp mixture on the screen surface. This makes it easier to move the mixture over the surface. The screen with the completed sheet of paper is then removed from the mould and couched (paper removed from the screen) onto a special stand that holds the post of newly made papers. The screen is aligned using the placement guides and carefully lowered onto the previously made sheet in such a manner as not to trap any air between the papers. The screen is then removed by lifting the edge nearest the papermaker, then it is lifted off away from the papermaker. The post of completed papers is left overnight to drain naturally. Then it is carefully pressed, lightly in the beginning then gradually more pressure is applied in order not to damage the paper. The post is pressed for about 6 hours until approximately 30% of the moisture is removed. Hundreds of paper are stacked and pressed gradually overnight to remove excess water. The paper is then separated and one by one placed on drying boards and taken out into the sun. The sun and wind will dry and bleach the paper, making an impressive sight on a fine day. Dried sheets of Kozo paper are held up to the light, then classified by thickness, color, etc. Through all this natural process the Washi has acquired a warm, delicate look and strength. Now the washi is ready to be used!